EVEN among the street folks of London there are not many who can boast of so varied a career as the hero of this chapter. Caney, whose name, it will be seen, expresses the nature of his work, once enjoyed the exalted position attributed to those who belong to the "pro." Thousands of poor people and pale children remember how he amused and delighted them with his string of sausages and his old familiar and typical salutations, as he made his appearance at the yearly pantomime of the Standard or Britannia Theatre. But Caney has now cut his last caper, though on seeing the accompanying portrait he may be tempted to exclaim once more "Here we are again, sir!" To begin his story at the very beginning, I should first relate that Caney commenced his career by absorbing such marvellous stories relating to the sea, that, like many other boys, he finally ran away from home. In the same way he in due time found the sea more agreeable in romance than in reality, though it must be confessed he endured more than ordinary hardships. After three trips in the Newcastle collier "Briton," he was so deeply grieved at the loss of a young friend and shipmate, whose life was sacrificed through the carelessness of some drunken sailors, that he left his ship. The boy fell overboard into the Thames in his attempt to clutch at a pier. The sailors themselves were so intoxicated that they failed to make the boat fast to the land, nor could they row with sufficient promptitude and steadiness to save their drowning companion. This incident so horrified Caney that on landing he resolved never to return to sea. He had, it is true, no other occupation and no friends; but he, nevertheless, walked forth boldly into the world, trusting to chance and fortune for bread and employment. This vague saunter brought him to Battersea Fields, and this in the days when that place was the great holiday resort. Here he made acquaintance with Hall, the keeper of the celebrated beershop known as the "Old House at Home;" - a remarkable haunt familiar to all who knew Battersea twenty or thirty years ago. For several years Caney remained in the employ of the eccentric landlord, and helped to keep the pigs, goats, &c., that lived with Hall's family in the one room the house possessed. Indeed, it was so curious an abode that there was once some difficulty in proving that it was a house at all. The beer licence had been refused on the ground that the hovel possessed no chimney; and, to be within the meaning of the Act, the landlord had to build a chimney at the last moment, thus reluctantly complying, in this detail at least, with the exigences of modern domesticity. Caney's next step in life was the management of a "six-boat up and down," which strange phrase means, I should perhaps explain, the circular swings that render so many people ill, but nevertheless constitute one of the chief attractions of a country fair. The better to watch over this implement of voluntary torture, Caney's new employer bought a second-hand wild-beast van in which the youth was able to sleep at night close to his "six-boat up and down!" It will be seen, therefore, that from his early boyhood, Caney had not been accustomed to gentle treatment; and if, in after-life, he has occasionally indulged in the British privilege of grumbling, this need not be attributed to exaggerated sensibility on his part. After attending Stepney Fair for two seasons, he obtained an engagement in Paterson's travelling show, where he impersonated the fool commonly known as "Pinafore Billy," and amused the audiences by submitting to the jokes and kicks liberally bestowed on him by the clowns. Improving with experience Caney was himself ultimately engaged as clown in Richardson's company, where he worked with Paul Herring, who appeared as pantaloon in the pantomime performed a few years ago at Drury Lane Theatre. After playing in many provincial theatres, Caney finally made his début in London on the boards of the old Garrick, the Britannia, and the Standard. He rendered good services at these houses in the cause of the people's amusement. No consideration of bone or nerve interfered with his assaults on the pantaloon. He was irrepressible in the matter of bonneting the police; and he tumbled and danced, and fought, and shouted to the delight of his rough and ready audiences,-and, poor fellow, to his own disadvantage. His exertions to please the people who greeted his first sally with vehement applause, caused the bursting of a varicose vein in his leg, and Caney's successful career was over. There was not enough bodily strength left in him even for a pantaloon. After enduring an operation which was performed at old St Thomas's Hospital, Caney was finally pronounced to be cured, but forbidden to attempt any violent exercise. Under such circumstances, he was naturally at a loss for some means of subsistence, and soon fell to the last stage of misery and poverty. But among the poor he met with that charity which the poor more than any other class extend one towards the other. A pedlar took compassion on him and initiated Caney into the art and mystery of mending umbrellas, and with a few hints and a little practical assistance from others as poor as himself, he was able to eke out a wretched existence at desultory and humble labour, now mending umbrellas, now making wire work, now dabbling in tinker's work of all descriptions, and thus avoiding while health lasted, both starvation and the workhouse. 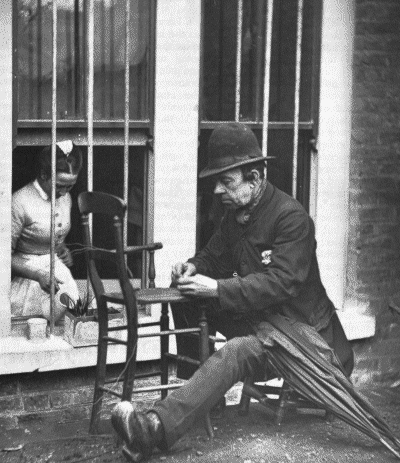 But of all the work he undertook, that of mending chairs seems to have brought him the most constant employment. In all cases his friends are of this opinion, for they have unanimously dubbed him "Caney," and it is under this soubriquet that he is best known in the purlieus of Drury Lane. At times, however, the old spirit broke loose again, and though he never appeared on the boards of any theatre, he has often graced the streets with some of his clownish antics. At Christmas, and other holiday seasons, he sometimes resorts to the familiar hare's foot and rouge, dons a clown's suit, which is certainly the worse for wear, and follows a band of itinerant street performers, among whom his superior accomplishments and experience insure ready welcome. Such imprudence, however, has more than once nearly cost him his life; and, but for an exceptionally strong constitution, he would never have survived the loss of blood attendant on the reopening of his varicose veins. Thus, as years crept on, Caney had to observe greater self-control, and constantly curb that frolicsome disposition which formerly suited him to the profession of clown; till at last his care-worn face fails to reflect his natural joviality, and in him, as in others, we find the indelible stamp denoting a hard life of struggle and adversity. There are, it is true, many worse employments than that of caning chairs, but nevertheless, the work is precarious, and at best does not bring in much profit. At High Wickham, the centre of the cheap chair manufacture, common beech chairs are made which are actually retailed in the East of London at less than £1 per dozen. These prove very attractive to newly-married couples, who are thus led to imagine that they can furnish a room or two for a few shillings. But experience soon shows that the wood of these cheap chairs has not been properly dried: they crack, and shrink, part at the joints, and fall to pieces, so that the dearer but sound article proves the cheapest in the long-run. These cheap chairs are generally made in the country, and men of Caney's type would scorn such shoddy wares. At Wickham the children do the caning, the women varnish, the men undertake the French polishing and other rougher work. When by their joint labour a family has produced a certain number of chairs, they entrust them to a van-driver, who takes them up to London and hawks them among the East End furniture-dealers. Having thus introduced into London a constant supply of cane-bottomed chairs, another industry, namely, that of mending the chairs when the cane had worn out, sprang up simultaneously. This was probably first originated by the gipsies; but others soon followed the example, and now a great variety of persons have learnt the knack. A considerable number of mechanics, formerly employed in heavy work which they have been obliged to abandon through ill-health, find this a light and commodious occupation. But they are terribly undersold by women's labour. The wives of artisans seek to assist their husbands by caning chairs for dealers, and are content to receive 3s. 6d. to 4s. 6d. per dozen and buy their own cane , and the value of the cane for each chair varies from a penny to three halfpence. Nor is this all; it is necessary to buy tools and apparatus for splitting the cane; and a married woman may be able to do so if assisted by her husband, but the poor man, the crippled mechanic, who has just left the hospital, is not always in so fortunate a position. Thus, the poorer the person the more likely is he to eschew the comparatively regular work but low pay offered by the dealers. He will prefer wandering through the streets, cane in hand, soliciting from door to door, for a solitary "job." When, however, this is secured, the profit is much greater, for the charge varies from eightpence to a shilling per chair, according to the quality of the cane, the size of the seat, and the probable wealth of the customer. The street chair-mender has generally to buy his cane all ready split and dressed, and this varies, according to quality, from 2s. 6d. to 4s. per pound weight. Nor will this amount cover more than six to eight chairs. The splitting of cane is so important an industry, that it has been worth while inventing a special machine for the purpose, worked by steam. With this contrivance some twenty pounds of cane can be split up, while a man could only cut about one pound; and even then would infallibly destroy the centre piece. This latter, it is true, is of very little value; still some use has already been found for it. The pieces thus saved are converted into little switches or canes, generally died black, and sold on Bank holidays for a penny. Dutch-metal ornaments, which can be bought at 9d. per gross, serve as ornamentation or heads for these canes, and they are quite good enough to delight a child, while affording a large profit on the penny for which they are retailed. As a rule, the men who cane chairs generally do other work as well, for this style of employment is rarely sufficient in itself. It is, on the other hand, clean and agreeable work; and, as it is generally done in fine weather and in the open air, it may be considered a thoroughly healthy employment. Further, it has the inestimable advantage of affording a means of subsistence to many persons who have no regular trade, and who would be driven to dangerous extremities, but for opportunities of this description. The biographical sketch I have given of Caney affords a good example of the circumstances which may bring a comparatively prosperous man down to the level where he will gladly avail himself of these easy methods of earning an occasional shilling.